From the Testing Lab: How does moisture affect brightness? The question was asked by a customer this week, "how does moisture affect brightness?" In this case the customer is making brightness pads, essentially a rough, wet handsheet. They have measured these for years. Now they are trying to use a wringer and microwave oven to dry the sheet to get a more accurate measurement of dry brightness. 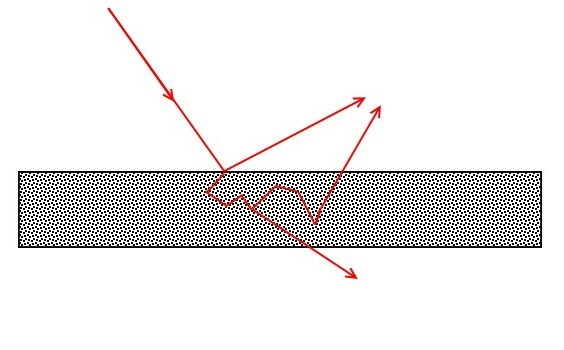 In general, a wet sample will allow more light to transmit through and not be reflected, therefore, the brightness will be lower on a wet sample. 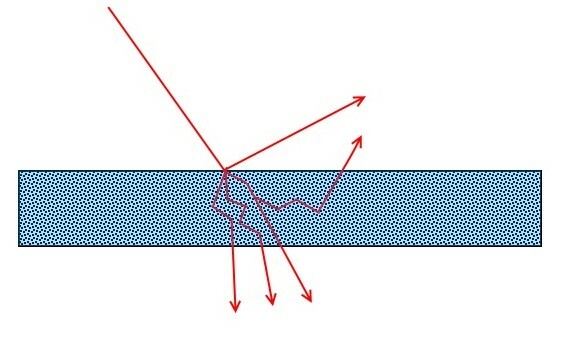 The refractive index of water is similar to that of fibers. This is why there is less scattering (reflectance) and more transmittance. A simple test was run using a dry piece of paper. The paper was folded to get an infinite pad and measured on an ISO brightness instrument. The brightness was 82%. The same paper was wetted and measured. The brightness dropped to 60%. This was an extreme example, but it helps illustrate the point....more moisture = lower brightness. Fillers help increase scattering (reflection) and, therefore, increase brightness. If the filler content is very high, there will be fewer pores for water to fill. This will limit the amount of brightness loss due to moisture. A wet sample is more likely to bulge into the aperture which artificially increases the brightness slightly. Also, drying the sample can result in an uneven surface for measurement which can yield mixed results. Averaging a number of readings is the best approach. Drying a wet sample will increase the brightness. However, if a sample is dried in a microwave, it is very difficult to determine when the sample is dry enough and not over dried. Just like other items in a microwave, the paper sample will likely dry from the inside. Handsheets and pulp pads can often seem fine on the outside, yet be yellow or brown on the inside due to over drying. The fibers on the inside will essentially singe. The simple answer is that moisture will reduce brightness. The degree of reduced brightness is due in part to the factors described above. If you have other questions about best practices, lab audits, quality programs, calibration or maintenance, email our Service Manager.